"We are in crisis...more must be done... The ultimate goal of governments everywhere should be to insure that every person has access to a sanitary, piped water supply." When I wrote to them about Amman Imman's project in the Azawak and the work of students to support it, they highlighted the project in a July 21 post on the blog. You can read about it on their home page. These innovative students have put their ideas into action by suggesting a fundraiser that is equally fun, creative and meaningful: making a specially designed scarf that is representative of water, and selling it to raise funds to bring water to people. 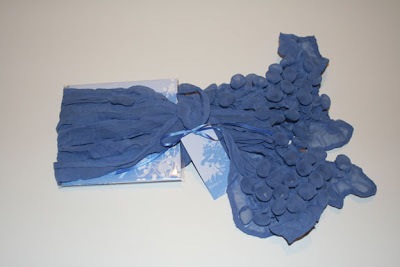 "Inspired by Japanese textile artist Yuh Okano, this scarf is symbolic of the beauty of water. Bubbles and ripples are created by steam in a technique called shibori, or “memory in cloth”. The cloth remembers the water that created it." "For as little as US$3.00, the cost of the fabric alone, you can make this scarf. If you sell it for US$25.00, less than the price of hand-made scarves in boutique shops, the US$22.00 profit you make can be donated directly to a water related charity." Let's dream a little here: What if, as we start our school year, teachers bring this scarf-making idea into their art rooms and classrooms as part of their world service fund-raising project, and donate the profit of $22.00 per scarf to Amman Imman's mission to bring water to the people of the Azawak? Not only would students be working with beautiful cloth that represents the form, flow and feel of water, but they would also making something with their own hands to help others. If, in a school of 100 students, each student made a scarf and sold it for $25.00, $68,200 would be raised to help people get the water they deserve as their human right. To download the instructions for making the scarf, please visit the scarf page on the Water is... blog. 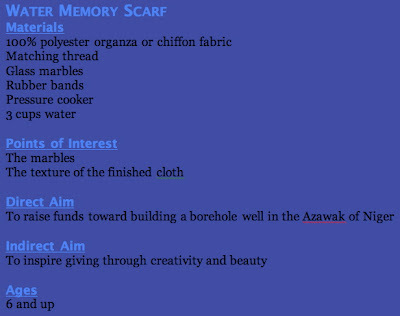 Scroll down to the last paragraph on that page to download a PDF file with instructions for the scarf and an accompanying tag. A note: This project requires some preparation before students can begin working with the material. Older students may be able to help with the preparation. The project is probably best suited to ages 6 and older. Please pass along this idea along to all your teachers and friends! I love you guys are doing to help raise awareness (and creatively, too!) for the water crisis in Africa. I wanted to share a fundraising opp. with y'all that I think could be very valuable---if you go to: http://apps.facebook.com/speedgranting/theme.php?tid=7, you will see a place to submit your proposal for a water project to win $1,000 from Razoo Speed Granting. Razoo has officially launched its September "Change your WATERworld" Contest that will give $1,000 to the organization with the most votes at the end of 2 weeks--- I would love to see y'all in this competition, so let me know if you've got any questions etc.